If you had access to social media in 2013, you witnessed former Disney princess Miley Cyrus twerk her way to the top of the music charts and offend almost every mom in America. After giving the world the (foam) finger, smoking marijuana on live television and rebranding Michael Jordan’s shoe label with the song “23,” Cryus’ actions have everyone asking the same question: Who the hell raised her? Well, that answer is found in the latest idiocracy to hit the Internet — a video entitled “Achy Breaky 2” by debut artist Buck 22, featuring former country music superstar Billy Ray Cyrus, Miley’s 52-year-old father. Suggestive must be a Cyrus family speciality, as the entire video is dedicated to space cowboy heaven, complete with scantily clad women, an e-cigarette bar and Billy Ray in a sleeveless top. 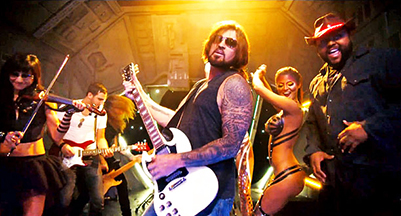 In the beginning of the video, the elder Cyrus is beamed up to a spaceship, where he is greeted by Buck 22 and a group of would-be strippers. Buck 22, Cyrus, the women and various back-up dancers seem to enjoy themselves as the ship travels throughout space. The song is nothing short of ridiculous, as Buck 22 raps unintelligible rhymes over a loud electronic track while Billy Ray jumps around and pays no respect to his once-popular country hit. At first, I considered Billy Ray’s antics as payback for all of the media attention his daughter has gained recently, as Miley’s twerking talents and her single “Wrecking Ball” are referenced at different points in the song. However, after hearing what the rest of the world has to say about “Achy Breaky 2,” I’ve learned that Miley actually encouraged the song’s production — making every member of the Cyrus clan just as crazy as the next. At the very least, Billy Ray’s “Achy Breaky 2” should be viewed for a hearty laugh. Personally, I considered it an excellent media stunt; however, it is not worthy of any musical praise nor is it something that listeners should take seriously. But if a comedic chorus based on an old country song mixed with electronic beats is your favorite style of music, “Achy Breaky 2” is definitely something you want on your playlist.